I think most people can agree that one of the most popular board games of all time is Chess. Chess and/or Checkers have basically become the go to abstract board games as most people have played them at least once in their lifetimes. With Chess being so popular there have been many people over the years that have tried to improve Chess. Some people have tried to add more strategy to Chess while others have tried to simplify the game for younger audiences. Today’s game All The King’s Men (also known as Smess: The Ninny’s Chess) attempted to do the later. While All The King’s Men succeeds at simplifying Chess, it ends up doing so to the detriment of Chess. Each player takes all of the pieces of one color. They will place their king in the middle space of their back row with two knights to both sides. The archers are then placed in the second row. Players choose which player will start the game. On a player’s turn they will get to move one of their pieces. When moving a piece they must follow the direction of one of the arrows on the space that the piece started the turn on. The king and archers can only move one space in the direction of one of the arrows. This archer used the forward arrow on their previous space to move forward one space. The knights can move as many spaces as they want in the direction of one of the arrows. No pieces may move through a space occupied by another piece. The brown knight piece can move forward or left as many spaces as it wants until it runs into another piece. The brown knight will be able to capture the tan archer. If a player moves one of their pieces onto a space occupied by one of the other player’s pieces they capture that piece and remove it from the board. The tan archer could move diagonally one space in order to capture the brown archer. If the other player’s king can be captured on your next turn, you must tell the other player “threat”. 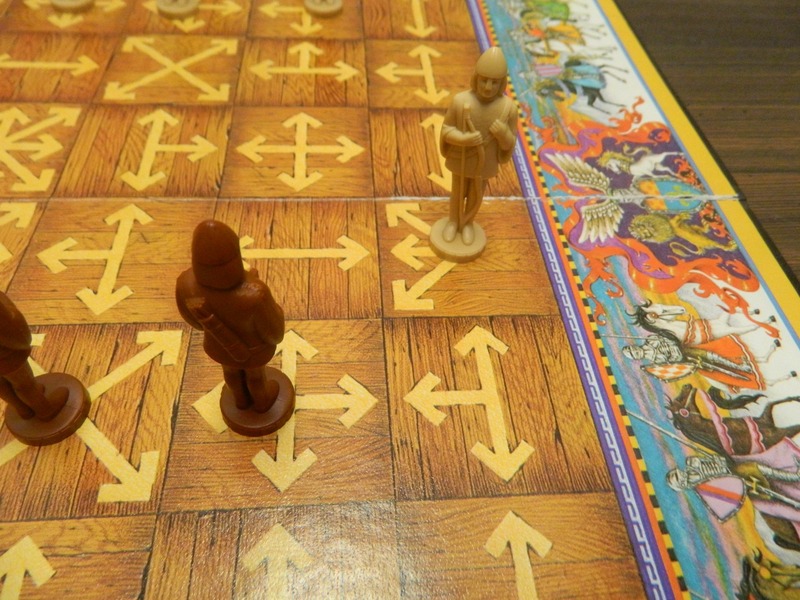 The other player then must try to make a move to prevent the king’s capture. 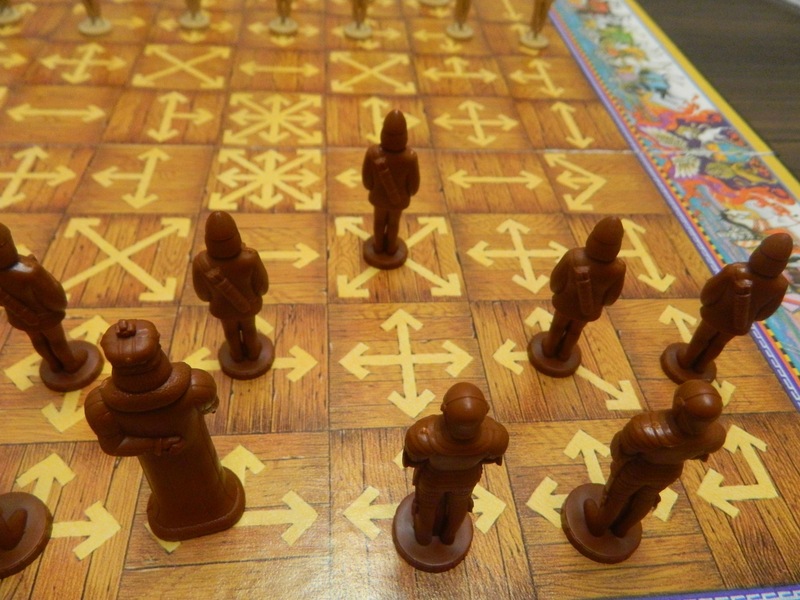 They can move the king piece out of danger, move another piece in the way of the attacking piece, or the player could capture the attacking piece. If a player is unable to make a move to save their king, the other player captures the king on their next turn. That player wins the game. This king is unable to move to a spot where it won’t be captured on the next turn. The brown player has won the game. 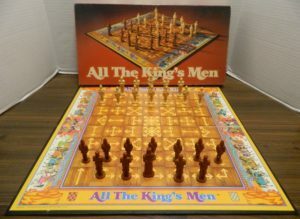 While All The King’s Men doesn’t play exactly like Chess, it shares enough similarities that it is pretty obvious that the designers took a lot of inspiration from Chess. Basically All The King’s Men takes Chess and removes the unique movement patterns from the pieces and puts them on the board itself. Instead of having to remember how all of the different pieces move, you need to focus on figuring out a path to get to the spaces that you want. 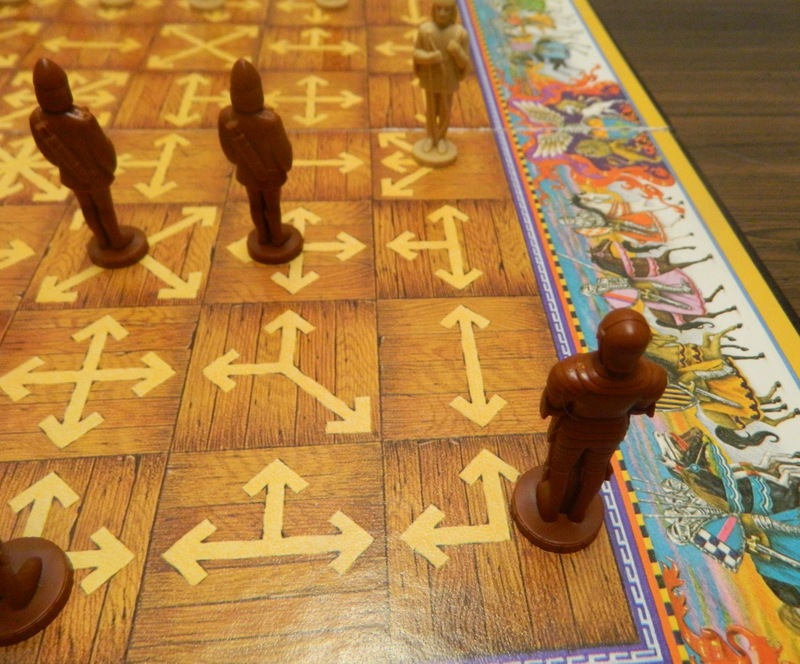 Since all the movement information you need is printed on the board itself, the designers succeeded in making All The King’s Men quite a bit easier to play than Chess. You should be able to teach the game to new players within a couple minutes since the players don’t have to learn the movement patterns of all of the different pieces. 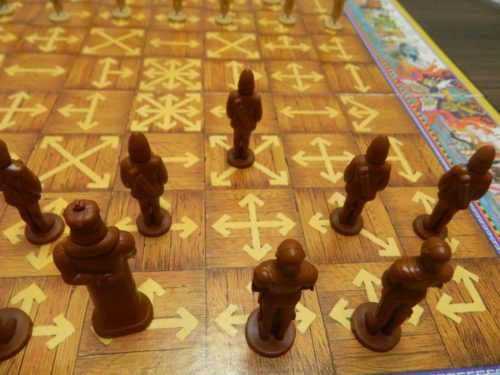 You just have to follow the arrows on the board and remember that archers and the king move one space while the knights can move as many spaces as they want in one direction. With the simplified rules I can see All The King’s Men working with children too young to play Chess as it could work as an introduction to Chess. While All The King’s Men is more straightforward than Chess, it actually retains quite a bit of the strategy from Chess. You can randomly move the pieces around the board but you likely won’t win the game unless the other player is doing the exact same thing. To do well in All the King’s Men you have to think several moves in advance. This is where you really have to pay attention to the movement patterns on the spaces. At first you might just pay attention to the spaces that your pieces are currently on as that indicates where your pieces can move. The more you play the game though you realize the movement pattern of the space you are moving to might be even more important. You don’t want to move to a space that your opponent can capture your piece but you also don’t want to move to a space that doesn’t offer the piece many movement opportunities. To get to a desired space you might have to plan several moves in advance. The movement patterns on the spaces are important because some spaces are much more valuable than others. Most of the best spaces are in the middle of the board which forces players to be more aggressive. The two middle spaces in particular are really powerful since if you can get a knight on one of the spaces you can move the knight to almost any other unobstructed space on the board. This makes it really easy to pick off pieces from the other player. On the other end of the spectrum there are plenty of spaces that give you next to no options which forces you to waste a turn just getting the piece to a new space that actually gives you some options. 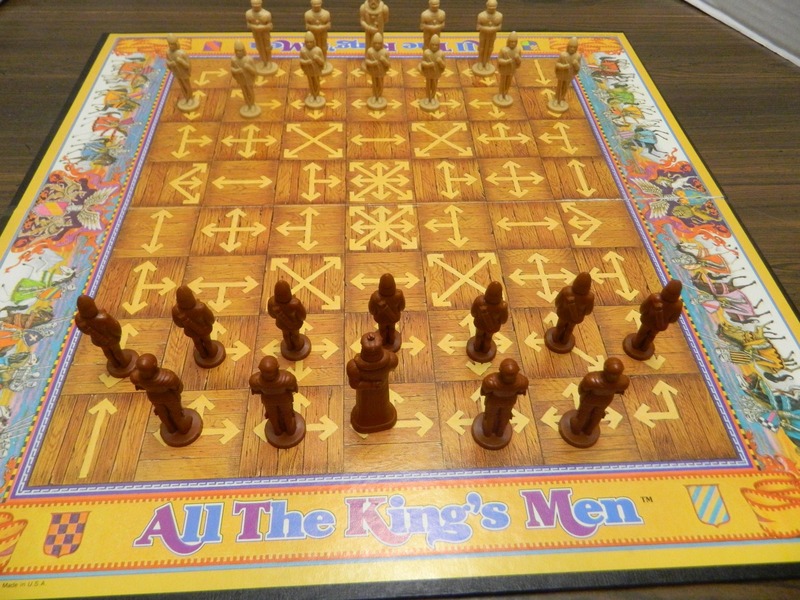 Other than simplifying movement options, All The King’s Men also reduced the number of pieces. The game reduced the number of pieces from six to three which is basically just two as the king and archer basically do the same thing. It feels like you get eight pawns and four queens to start the game. The archers and king move one space at a time so they are about as useful as a pawn. The knights can move as many spaces as they want in one direction which makes them feel like queens. This does a good job simplifying the game but it does create some issues which I will get to shortly. With the knights basically acting like Queens it is no surprise that they are by far the best pieces in the game. The archers can help you capture some pieces but you are going to have a very hard time winning the game without the use of your knights. With the knights being able to move as many spaces as they want in a direction they have so much more flexibility than the other pieces. They likely will be responsible for capturing a lot of the other player’s pieces. If only one player has knights remaining they will very likely win the game. This does create some issues for the game. It is much easier to remember how to move the pieces but I think it actually hurts the game. With only two real options for pieces, the game is missing the strategic options available in Chess. The game would have benefited from having more types of pieces. With only two types of pieces there are a lot of times where the players just end up exchanging pieces. One player will take an archer and on the next turn the other player will take the archer that took their piece. This leads to kind of a drawn out experience where both players just dwindle each others’ forces until one player doesn’t have much left. Basically the game comes down to which player makes a crucial mistake first. If both players don’t make mistakes one of two things will happen. Both players will continue to exchange pieces until both players have nothing left. The players otherwise could just avoid each other and nothing will happen. The only way this stalemate gets broken is when one player makes a mistake. It is actually kind of easy to make a mistake since it is hard to look at all of the different movement possibilities on a given turn. One player will miss a move the other player can make which will lead to their defeat. This illustrates the biggest problem that I had with All The King’s Men. The game is just kind of dull/boring. Mechanic wise there really is nothing wrong with All the King’s Men. There are no broken rules and when a player loses they can only blame themself. The problem is that the game is drawn out to the point that it gets boring. All the King’s Men tried to do something unique with Chess. 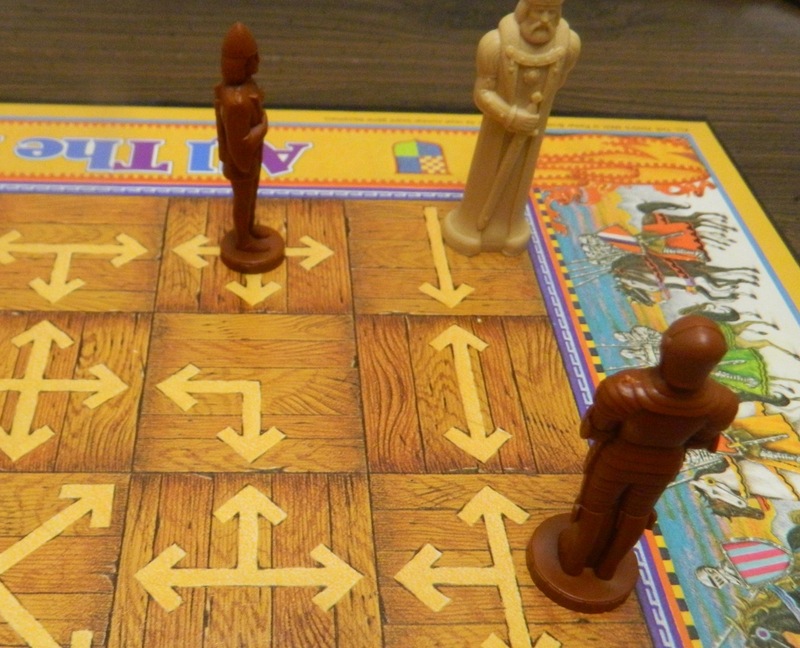 It succeeds in making Chess easier to play but at the same time makes it less interesting. Finally there are some things that I like and dislike about the components. For a Parker Brothers game the pieces actually look really nice. The pieces are only plastic but show quite a bit of detail. The problem with the pieces is that from the backside it is kind of hard to tell the difference between the archers and knights. The gameboard is pretty typical for a Parker Brothers game. It is made of somewhat thin cardboard and the artwork is kind of bland. Should You Buy All The King’s Men? All The King’s Men is an interesting board game. The game really doesn’t have any broken mechanics. It has no reliance on luck and actually does a pretty good job simplifying Chess. The problem is that by simplifying Chess it takes away some of the enjoyment from playing Chess. With two equally skilled players the game just feels like a game of attrition until someone makes a mistake that loses them the game. There is nothing really wrong with All The King’s Men but it is just kind of boring. 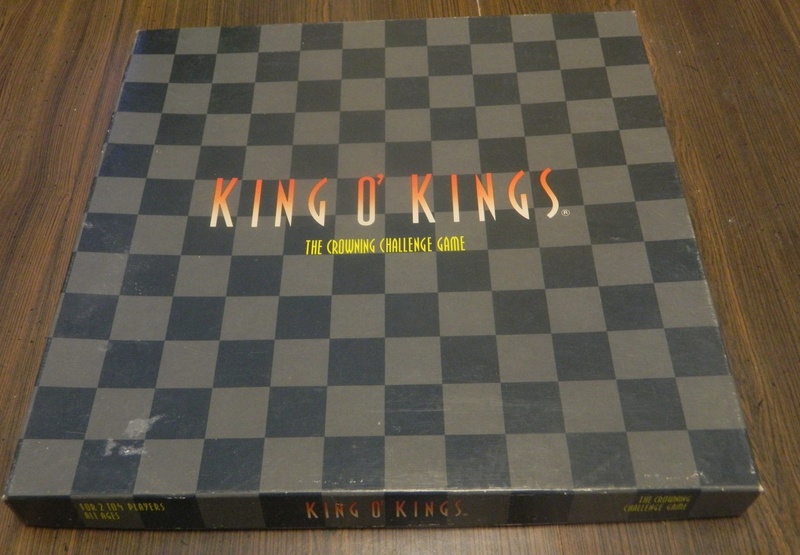 If you don’t really like abstract games like Chess I don’t see you enjoying All The King’s Men. I found the game to be kind of boring but if the game’s concept interests you I think you could get some enjoyment out of it. I would look for a good deal on the game though. My boys learned to play this game before they ever attended school. Lots of fun. It made learning chess and the strategies that go with it easier. Does a good job making Chess easier to play. Simplistic and yet has quite a bit of strategy. Simplifies Chess a little too much.